Last week, Gov.-Elect Tony Evers reversed course on a handful of issues that were cornerstones of his campaign. The incoming governor already has a well-documented record of changing his story on whether he plans to increase taxes on Wisconsinites. But as he made the rounds in the media, Evers went on the record discussing a slate of hot button campaign issues – and, in several cases, directly contradicting his own previous statements. When it comes to taxes, Evers has gone from “everything’s on the table” to an 11th-hour campaign promise to “raise no taxes” and, remarkably, back again. Evers has changed his tune on key policy issues like school choice, Foxconn, abolishing the Wisconsin Economic Development Corp. (WEDC), the minimum wage, and Act 10. While his rapid 180 on whether, as a constitutional office holder, he will follow the laws passed in last month’s extraordinary session received some notice in the mainstream media, we have assembled a comprehensive list of every issue on which Gov. Evers’ has changed his position. During the campaign, Evers talked about cutting middle class taxes and paying for it by scrapping or scaling back the state’s manufacturing and agriculture tax credit. But in the final days of the campaign, on Nov. 1, Evers reversed course, telling The Washington Post that,”I’m planning to raise no taxes.” Some speculated that the Governor’s change was a last-minute attempt to keep the support of voting taxpayers. Now, he has reverted to his earlier position. In a round of interviews last week, Gov. Evers said he wants to cap the state’s manufacturing and agriculture tax credit at $300,000 a year in income. That would amount to a significant tax hike on Wisconsin businesses and farmers, many of whom file business income on their personal income tax forms. Evers also said last week that his first budget will roll back protections for local property taxpayers, breaking his campaign pledge “to raise no taxes.” It would also overturn one of Gov. Walker’s hallmark accomplishments – the statewide property tax freeze. The governor-elect also told the Milwaukee Journal Sentinel he’s open to the idea of allowing local governments to raise their sales tax. Evers quickly changed his mind about whether he’d follow, or ignore, a slate of laws passed in the Legislature’s extraordinary session last month. He told reporters during a series of interviews on Wednesday that he would refuse to follow some of the laws, signed by Walker in December, that restrict certain powers of the governor’s office. By ignoring some of the laws, he was hoping to draw lawsuits from his foes. “Tony Evers says it will take a lawsuit to get him to go along with lame-duck legislation,” read a headline in the Journal Sentinel published Wednesday. He slept on it, and changed his mind by the next day. At a Thursday news conference, he again reversed course. “I have no intent of breaking the law,” he told reporters. 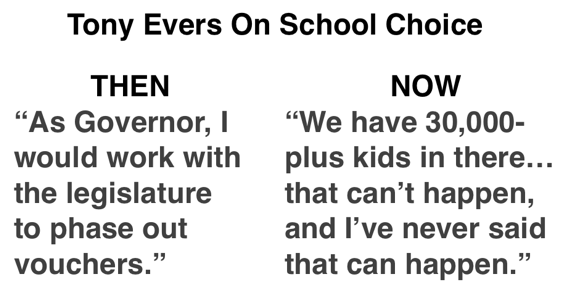 While Evers’ change of tune on the extraordinary session laws was his fastest, maybe his most significant is his new position on abolishing school choice. The state’s school choice programs offer state support for families who want to opt out of the public education system and send their children to private schools. On the campaign trail, Evers made his stance clear: he wants to abolish the program. “As governor, I would work with the legislature to phase out vouchers,” he said in a School Administrators Alliance survey. “I’ve spent the last 20 years fighting back against vouchers and privatizers. On my watch, we’ve removed more than 30 schools from the voucher program and prevented dozens from joining,” Evers said. Faced with a Republican Legislature unlikely to go along with any effort to abolish school choice, Evers now offers vague promises of “transparency.” Among them, he will push to include the cost of school choice on property tax bills in hopes it sparks a “conversation” about the program. Evers’ choice of advisers suggests a conflict in his incoming administration’s stance on school choice. Heather Dubois Bourenane, director of the Wisconsin Public Education Network, was named to Evers’ “What’s Best for Kids” Advisory Council. Bourenane is a top-flight foe of Wisconsin’s school choice program and a persistent advocate for the public education industry. Evers’ new, unequivocal statement rejecting the dismantling of the choice programs isn’t likely to sit well with Bourenane and those in her corner. Something to watch as Gov. Evers puts together his first budget. “I’m not going to be proposing anything in the budget about WEDC,” Evers said in Wednesday’s WisconsinEye interview. That stands in stark contrast to his campaign pledge to abolish the quasi-public economic development agency championed by Walker as a replacement for the state’s old Commerce Department. He’s also backing off his criticism of WEDC’s top achievement over the past eight years, Foxconn. While he never went as far as his primary opponents who called for the wholesale cancellation of the milestone economic development deal with the Taiwan-based electronics giant, he was highly critical of the project. During the campaign, Evers said he would hold Foxconn’s feet to the fire, saying just enough to placate the far left that hates the deal and the tens of thousands of private sector jobs it promises to bring. But Evers recently backed off much of that rhetoric. “We have to have good working relationships with them (Foxconn),” Evers told WisconsinEye’s Steve Walters. While he repeated the vague assertion that he would “hold their feet to the fire,” Evers also admitted that the company is “making some proactive steps” in how the company is handling wetlands as construction proceeds. Construction is currently underway on Foxconn’s massive, $10 billion manufacturing campus in Mount Pleasant that promises to create 13,000 high-tech jobs – the largest economic development deal of its kind in U.S. history. During the campaign, Evers’ vision for a minimum wage increase was pretty clear: “We’re going to $15 an hour minimum. Minimum,” he said at a rally at UW-Milwaukee to roaring applause from the crowd of Bernie Sanders supporters. But in an interview with the Wisconsin State Journal, Evers seemingly backed off the $15-at-a-minimum promise, declining to give a specific figure. While his first budget will offer a “clear pathway” to raising the wage, “Evers declined to say how, or how much, his budget would propose to increase the state’s minimum wage,” the newspaper reported. A stalled drive toward a higher minimum wage would be good news for the Badger State. Such a drastic increase might sound good to the Bernie Sanders crowd, but it would likely backfire on those it’s ostensibly supposed to help. As a growing body of research shows, the forced $15 is coming with some ugly consequences. A new study from the University of Washington found Seattle’s path to a $15 minimum wage to date appears to have caused employers in the Emerald City to trim low-wage worker hours by 9 percent on average. They earned $125 less each month following the most recent increase, according to the study, funded in part by the city of Seattle. A 2014 MacIver Institute study found 91,000 Wisconsinites would lose their jobs if the minimum wage was raised to $15. Considering that many of those are entry level jobs, a “living wage” mandate would eliminate countless opportunities for young workers just getting started in their careers. During the primary, Evers backed repealing Act 10, Walker’s signature collective bargaining reform law that’s saved taxpayers more than $5 billion. “Tony is supportive of returning collective bargaining rights to public employees,” said campaign manager Maggie Gau in a statement. If Republicans were to maintain control of the Legislature, Evers said at the time, he’d still work toward a compromise giving government employees more bargaining power and tipping the scales of government away from taxpayers and back in favor of state workers. Now that he’s the incoming governor with a Republican-controlled Legislature, Evers is telling the media he hasn’t made decisions about Act 10 yet. “[T]hat’s part of the budget we haven’t made any determinations on,” he told the Wisconsin State Journal. Indeed, any significant changes to either Act 10 or the state’s right-to-work law would need to go through the Republican-controlled Legislature. Instead, he’s looking for ways to circumvent the Legislature. “[I]n a nod to the improbability of passing such a change through the GOP Legislature, Evers said he has considered non-legislative moves such as hiring Cabinet secretaries ‘that value input of employees,’” the paper reported.